Additional Documents for Marketing, Laws and Rules, Directory of Attorneys, Production Contract Specific to This Business 72 pages. Just what you need to know. No fluff. Legal Documentaries are a growth industry. How about a new revenue stream that rewards creativity and documentary skills? It almost sounds too good to be true, right? Believe it or not, there is a great market in the legal world for a certain kind of skillfully-made documentary videos. 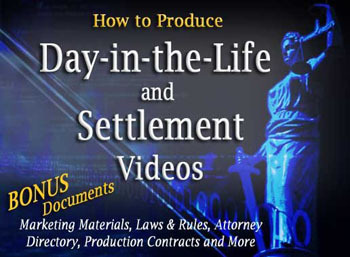 They’re called Day-in-the-Life Videos and Settlement Videos. They are used by lawyers to either settle out of court or to win their cases. Usually under 15 minutes, these videos have the look and feel of TV news magazine pieces. Day In The Life & Settlement Videos are a perfect niche business for skilled doc producers. I’ve put together a special package to help you excel in this business, but it’s exclusively for producers already skilled in making documentary-style pieces. I think you’ll appreciate all the gems that will help you master this little known niche. Learn the secrets to making your documentary skills invaluable to trial attorneys, such as the difference between documentaries that are shown in court and those that can only be shown during pre-trial. This knowledge alone makes you invaluable to trial attorneys. Your techniques really work. I didn’t know any lawyers, but I managed to find one who needs a video. I have my first client. Thanks again – Jason M.
See videos of successful legal documentaries on our password-protected web page. You’ll discover what works by watching these videos. And we’ll give you the production tips for getting the job done efficiently. This business is not for the inexperienced. If you’ve never produced a complete documentary on a deadline, this business is not for you right now. But there’s no reason you can’t get a head start on preparing yourself to enter the business after you have more documentary experience. You’ll get a customizable Letter of Agreement you can use to help you close the deal. It’s fully explained and is easily modified. You get a Billing Log, Lists of Attorneys in every state who hire producers, and much more. You’ll have everything you need to get into this lucrative, interesting work. This could make all the difference in your video business. While most producers start their business working with local attorneys, it is quite possible to build this into a regional or even national business. It comes with a 90 Day Money Back Guarantee so you have nothing to lose. Start today!